A disabling condition can happen to anyone at any time. As a member of the NYSLRS, you may be eligible for a disability retirement if you become disabled and unable to work. Disability benefits are based on your tier and retirement plan. The eligibility and filing requirements can vary too. Most members with 10 or more years of service credit can apply for an ordinary (non-job-related) disability benefit, and in some circumstances, your employer can file for you. If you become disabled due to a job-related accident, there’s no minimum service required. As soon as possible after you stop receiving your salary. You can find a list of all the disability retirement applications on our website. You can also read about the filing requirements in your retirement plan publication. If your application meets the filing requirements, we will request medical reports from the doctors and treatment facilities you listed on your application. 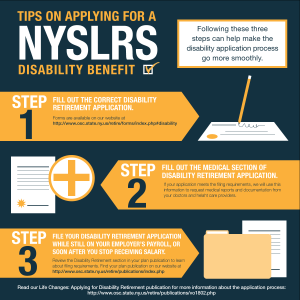 We may also ask you to make an appointment, paid for by NYSLRS, with one or more independent medical examiners whose specialty relates to your disability. A medical or administrative review board will then make a determination about your eligibility. If you aren’t approved for a disability retirement, you may request an administrative hearing and redetermination within four months from the date of denial. This gives you an opportunity to provide more evidence to support your request for disability benefits. Because of the multiple steps that can be involved in the process, these cases typically take longer than regular retirement cases. So, since it may take some time to process your application, we encourage you to file the application while you are still on the payroll. This can help minimize any financial hardship you may encounter during the time it takes to process your application. For more information about the disability retirement process or how to file, read our publication, Life Changes: Applying for Disability Retirement (VO1802). Content last revised March 9, 2016. This entry was posted in General News, Members and tagged administrative hearing, disability, disability benefit, disability eligibility, disability retirement, disability retirement application, ERS, Information is the Key, know your benefits, medical, members, New York State & Local Retirement System, NYS, NYSLRS, PFRS, retirement, retirement plan on March 9, 2016 by NYSLRS. In order to verify your information, or check on the status of or eligibility for any benefit, please email our service representatives using our secure form (link below). Please explain all relevant information in the comment field of the form.